I had some dreams they were clouds in my coffee. 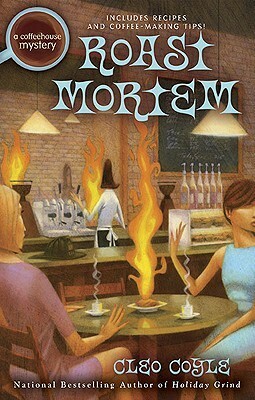 Coffee shops around New York City are the targets of arson in Roast Mortem by Cleo Coyle, the ninth book in Coyle’s popular Coffeehouse Mystery series. Clare Cosi, the manager of the historic Village Blend coffee shop in Greenwich Village and an amateur detective with an impressive crime-solving resume, sets out to discover who’s setting the fires. Clare’s stake in solving these crimes is personal. The first coffee shop to go up in flames is Caffè Lucia in Astoria, Queens. Its owner, Enzo Testa, is a longtime friend of Madame Blanche Dreyfus Allegro Dubois, the owner of the Village Blend and Clare’s former mother-in-law. On the night of the blaze, Clare is at Caffè Lucia with Madame and Dante Silva, one of the Village Blend’s baristas. Clare escapes serious injury, but Dante is knocked unconscious, and Enzo and Madame are trapped in the basement. All three are rescued, but they end up in the hospital, with Enzo in critical condition. Other coffee shops throughout the city are also being torched. As if the injuries to her friends were not enough, Clare has reason to fear that the Village Blend will be next. The Fire Department is skeptical at first that the Caffè Lucia fire was deliberately set. But as more coffee shop fires occur, arson seems increasingly likely. And the situation becomes more desperate when firefighters start to die. Some clues point to terrorism, but Clare is convinced that the motive is more personal. Clare’s determination to find the arsonist and put a stop to the coffee shop fires puts her at odds with some members of the FDNY. Fire Captain Michael Quinn, the estranged cousin of Clare’s police detective boyfriend Mike Quinn, is more interested in making passes at Clare than in listening to her theories. But Clare is able to gather evidence with the help of her coffee expertise. She gets closer to some of the Queens firemen by teaching them how to use their newly donated espresso machine. She also volunteers to provide the coffee at a city-wide FDNY charity bake sale. As Clare gets deeper into the case, she finds more and more suspects. Can she prove who is actually to blame? And can she do it in time to save the Village Blend from the arsonist’s torch? Roast Mortem is another strong entry in the Coffeehouse Mysteries series. There are fewer scenes than usual set in the Village Blend coffeehouse itself, and fewer appearances by some of the baristas. But the main characters in the series — Clare, Madame, Mike Quinn, and Clare’s ex-husband Matt — all play prominent roles. And as usual, the story is infused with lots of educational information about coffee, coffee and espresso making techniques, and the coffee business. One of the trademark features of the Coffeehouse Mysteries books is an appendix with numerous recipes for coffee drinks, desserts, and other treats from Clare’s kitchen. With some delectable recipes, including “Clare Cosi’s Doughnut Muffins,” Roast Mortem does not disappoint. If you enjoy a good mystery with strong, usually likable characters, if you like reading stories set in New York City, or if you enjoy a good cup of coffee or espresso, Roast Mortem by Cleo Coyle is worth a read. It’s another entertaining installment in the Coffeehouse Mysteries series.